Garner Narrative currently has a group of paintings by the gallery’s owner, Joyce Garner. 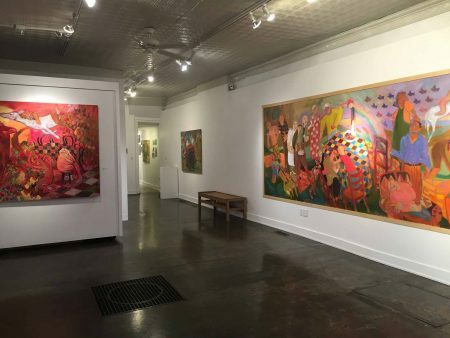 Garner’s paintings about family, currently installed at Garner Narrative in Louisville Kentucky until December 29th, couldn’t come at a more seasonally appropriate time. Walking into Garner Narrative the viewer is met with the gigantic six yard wide loose stretched canvas, yellow brick road. Installed directly to the wall and then framed with nailed plywood framing strips, yellow brick road is a navigation into the human capacity for love, respect, disgust, disappointment, compassion, and pure joy that can, if you’re lucky, come together in a neat little basket that can only be provided by being surrounded by people you may or may not be related to. All of this within a house made humid by too many people and all of the kitchen appliances running at the same time. You, all the while, regretting wearing so many layers and not drinking beforehand. To clarify, I’m not cheaply proposing that the subject of Garner’s largest painting at cul-de-sac is about the holidays; but in 2017 when else do most people see that much of their family? It’s an inevitable correlation. 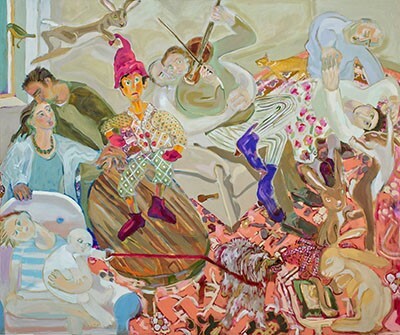 It does seem apparent that this work is about care and interpersonal dependency: each of the multiple groupings or couplings of figures are clearly engaged in the acts of an intimate relationship, but these relationships aren’t clarified for the viewer. The viewer is, instead, left to project their experiences within those specific gestures, creating their own narrative. The composition floats somewhere in between an interior scene and landscape, with a streaming; well, yellow brick road from one corner to another; connecting the multiple narratives existing within the same visual plane. Garner’s excellent intuitive understanding of complimentary color theory is exemplified here with her nectarines and teals placed provocatively next to each other— creating vibration, urgency, and motion throughout the work. Joyce Garner, “yellow brick road”. 6×18’. oil on canvas. With the viewer being provided this monstrous painting in which to compare all of the others, I’ll head in the direction of two paintings I found worth discussing because of their similarities in symbolism and stark differences in tone and emotive qualities, whilst maintaining themselves as steadfast examples of the exhibition. got no strings and ice cream are indicative of Garner’s understanding of space and how to intentionally manipulate it. Both paintings warp space with the utilization of a table top being pulled toward the viewer in a hefty reference to Matisse. Both paintings contain string instruments and dogs with teeth exposed. got no strings also has rabbits similar in style to the rabbits found in Paula Rego’s works, but they don’t appear in ice cream. ice cream and got no strings have flat planes of striped material or floral patterning and there is consistently a juxtaposing mix of illusionistic paint application and a complete and utter flattening of space that I find really appealing. Joyce Garner, “got no strings”. 60’ x 72”. oil on canvas. Detail from “got no strings”. For me, The most successful attribution to got no strings is the pulling sensation that Garner is able to achieve with her depiction of the floor. Garner pulls the rear of the image into the foreground via a disregard for rules of perspective. 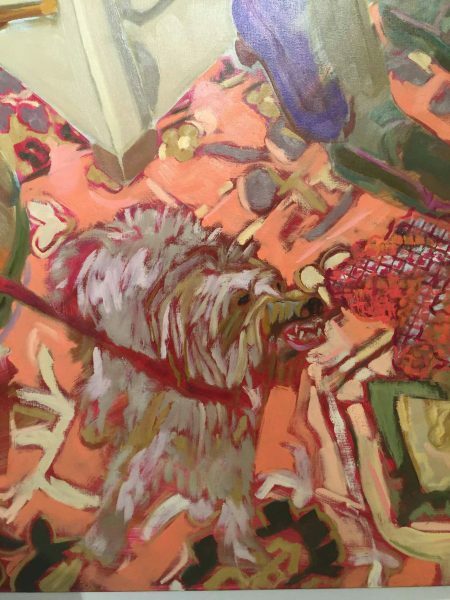 She then uses a highly saturated coral to lift the floor forward in the painting—it is conflicting for the eye and it becomes tricky to decipher whether Garner is attempting to push the image downward, or attempting to bring the background into the foreground. It’s disorienting, and places the viewer in a position in which they have to make an immediate decision as to where they will go in the space. Overall, got no strings is inviting, pleasant and—contradictory to those two things—compellingly challenging. 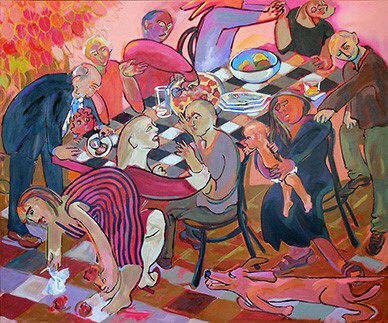 Joyce Garner, “ice cream”, 58 x 78”. oil on canvas. ice cream is more malevalent in tone. Though presented with a palette that is warm and inviting, there is definitely something deliberately sinister about this painting. Shapes and patterning become increasingly abstracted to the point of hovering over the rest of the image (an example being the striped dress in the foreground). Almost every figure in ice cream is contorted into some uncomfortable, if not unimaginable, position. Most notably is the figure at the top center who is cutting a pizza whilst rotating his arm back towards him, his elbow pointed away from his body, the pizza cutter coming towards his torso. Then there are the two figures at the very back of the table participating in, what looks like, an excruciating arm wrestling match. You’ll also find a lover’s quarrel and an older male figure with an expression that resembles mourning in the right corner of the image. ice cream is heavy with evergreen, black, and pinkish-maroons next to hot lilacs. ice cream made me uneasy through the subtle micro aggressions placed on the figures. The painting is a success because it displays the insectionality of our humanity— all of us are all things, all of the time. 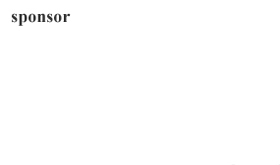 Garner seems to be an artist who cannot verbalize her strengths. Her strengths including having the capacity for empathy for her subject, her ability to utilize the visual jargon that has been set forth by art history in a way that communicates efficiently to an audience, and her use of color. Her paintings in cul-de-sac are successful, though I wish explained with more intention and depth. I am left with a lot of questions, but that’s alright. cul-de-sac is on display in Garner Narrative Contemporary Fine Art now through December 29th.